rocky's bru: It's business - and politics - as usual in Malaysia after the D.O.J. It's business - and politics - as usual in Malaysia after the D.O.J. 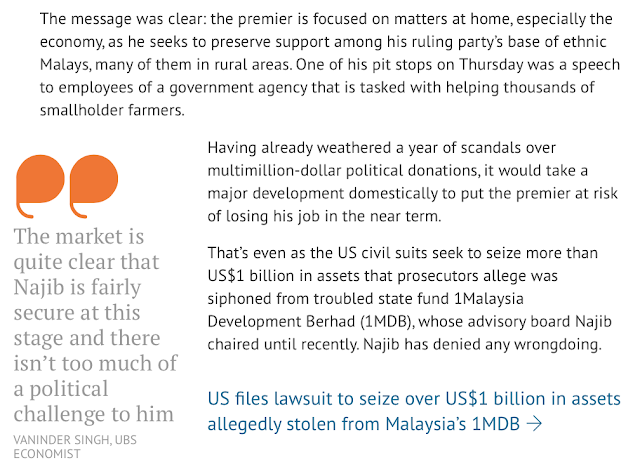 I thought Bloomberg reported quite well the aftermath of the US Justice Department's take on the so-called 1MDB scandal via this article It's business as usual for Malaysian Prime Minister Najib Razak amid graft scandal. It has all the relevant facts of the matter, carries the views of analysts both pro and anti, and furnishes the bigger picture for Malaysia so that the reader can place things in perspective. The only thing missing, perhaps, is an agenda. The agenda. 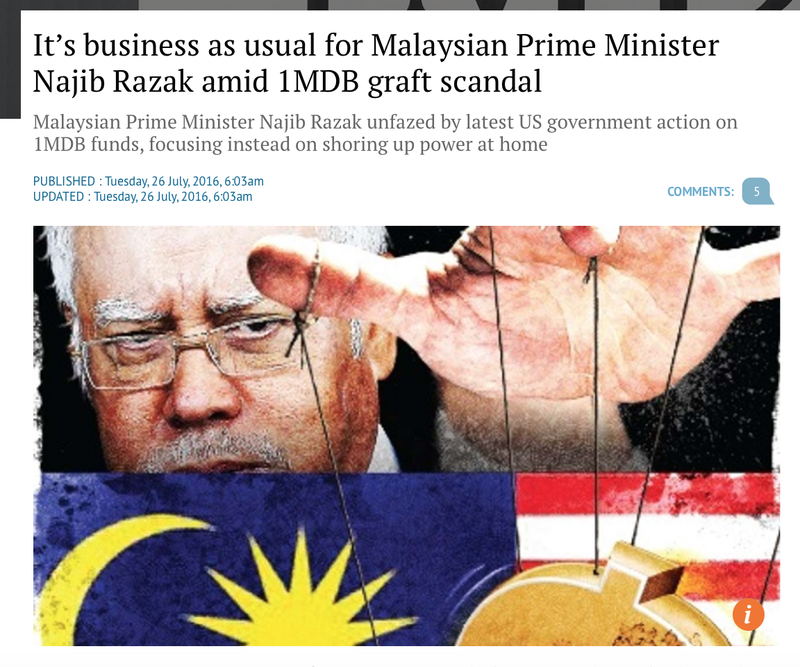 The crusade shared by the likes of The Sarawak Report against the Malaysian Prime Minister for alleged misdeeds, crime, graft etc that they have attributed to 1MDB. The Bloomberg article doesn't make the picture look prettier than it really is. But it doesn't fabricate anything to make it look uglier than it already is, either. It's what good, old journalism does. Read the entire Bloomberg article via South China Morning Post h e r e.
Lu tak tanye boss kau, kenapa dia tak rasa malu ? Kenapa kulit dia tebal ma'am kulit hippo ? The whole world points to him as Malaysian Official 1, but he refused to confirm or deny. DoJ say his donation came from 1MDB and not from some funny Saudi Prince. In other words, the U.S. gomen said your boss lied. Still, your boss kept quiet. Zahid also lied, since he verified the donation from the Arabs. So why don't you write properly, fairly, and ask your boss and Zahid to explain why the US gomen inferred they lied to the rakyat ? Or ask Shafee to quickly lodge a lawsuit against the US gomen. Do responsible journalism, Latuk. We cannot be accused by a foreign country of lying and stealing. Neither can the country have such leadership if the accusations are true. "... IF the accusations are true". You said it. Well done! As for what Zahid or Shafee should do, it's up to them. Get your boss (Guan Eng, Anwar?) to put pressure on them. Glad to hear Pemuda UMNO was lodging a police report on Zeti, Gani and Abu Kasim. Let them speak up. They have been so quite. Let's open up everything.